I am a girl with thick, heavy hair. When it was long I just let it be, besides an occasional spritz of dry shampoo for a little more oomph. But now that I've gone for the chop my hair needs a lot more love. I have a long bob, and if I use heavy duty conditioner and shampoos my locks get weighed down and they just hang limp down the side of my face. 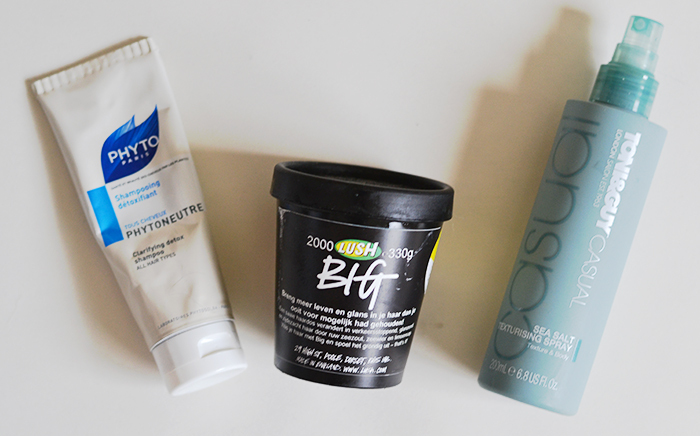 I use a collection of products to make sure my hair has a bit more grip, more texture, and holds styles a lot longer. Phytoneutre is a detox shampoo from France. This shampoo smells like mint and rids your hair of any leftover residue from styling products. Buildup from hair sprays, dry shampoos, mousses or leave in conditioners can cause buildup on your scalp which weighs down the hair and makes it greasy faster. When I use this my scalp feels super fresh. But besides the detox properties this also leaves my hair feeling clean but textured. It isn't overly smooth so heat styling sticks around a lot longer instead of just slipping out. 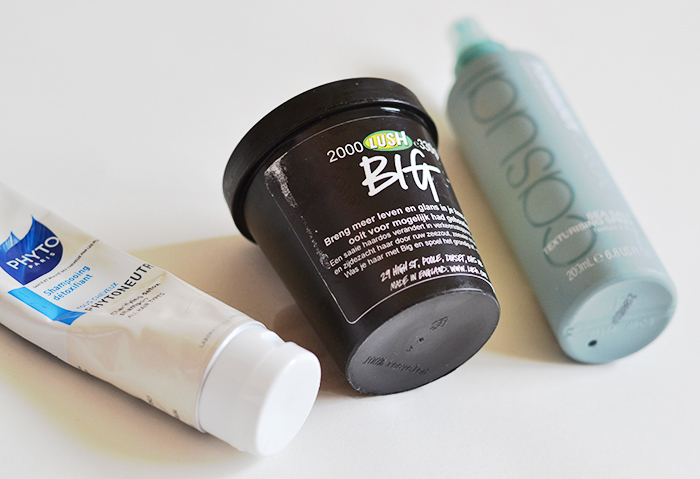 Loved by a lot of people and one of the weirdest products I have ever used is the Lush Big Shampoo. This product is made with sea salt. Big, coarse chunks of salt that you rub into your hair as an effort to clean it. The first time I used it I felt a little dirty afterwards. But I was pleasantly surprised when I blow-dried my hair and was left with gorgeous locks with a subtle wave and lots of volume. Rubbing this right at your scalp instead of all over the lengths is my trick. If I focus this on my scalp it really builds the volume while keeping the lengths of your hair manageable. If you have really tangly hair, however, I recommend having something close by that de-tangles. The last, but probably my favorite everyday texturizer is the Toni & Guy sea salt spray. This stuff not only leaves great texture that can help waves stick around all day it also smells absolutely wonderful. I use it on towel dry hair before I blow dry, and I use it before I go out. This stuff combined with the wind on my walk to the station creates subtle, tousled messy hair that looks effortless. I adore it.